Najo® Lite Board no pins- Color:RedNAJO Lite BoardThe NAJO Lite is our lightest NAJO backboard at just 14.5 lbs. and features a central slot in the lower half of the board to immobilize each leg separately. The Lite also features two handholds at the tapered end to allow more stable transport and angled edges for easy log-rolling. Strong, one-piece HDPE construction is impervious to all bodily fluids, is easy to decontaminate, and provides 100% x-ray translucency. This board is also buoyant and can be used to float a patient in the water. Standard colors are: red, orange, yellow, green, and blue. All other colors may require a minimum quantity for purchase. 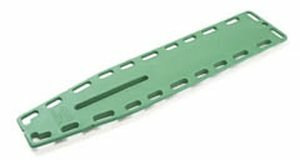 Features: • Two handholds at the tapered end allow more stable transport.• Angled edges for log-rolling• Central slot in the lower half of board to immobilize each leg separately• One-piece, high-density, polyethylene plastic construction, with polyurethane foam fill and greater density around the handholds• Impervious to all bodily fluids• 100[%] X-ray translucent• All boards meet OSHA recommendations and are easy to decontaminate• 2-year warranty• Available with 10 or 18 pins• Colors Options:• NAJO® Backboards are available in standard colors: red, orange, blue, green and yellow. Custom colors can be accommodated for larger orders (50qty minimum). Also available in a split color version, taking two of the standard colors and applying them to opposite ends of the backboard.• Custom Graphics:• All NAJO® Backboards (except the Disaster Board) can be ordered with custom graphics. Place your name or logo on the board to distinguish your boards from other services’ . Graphics are permanent and cannot be removed.To order custom colors or graphics contact Ferno Customer Service at 877-733-0911 Product photo may not exactly match the product offered for sale. Please refer to the product description. If you have any questions about this product by Ferno, contact us by completing and submitting the form below. If you are looking for a specif part number, please include it with your message.